‘Toxic Mould’ A con of the highest magnitude. As we approach another autumn and winter, condensation and damp derived mould problems will begin to top the table of all damp proofing enquiries, for me, my firm and most others in the preservation industry. This happens every year at this time, so I thought I’d share my growing concern, that consumers are being mislead, lied to and preyed upon by those whom they seek advice from, when it comes to mould in homes. If you are worried about mould in your home, especially if there is lots of it, then you are right to be concerned; a home shouldn’t have environmental conditions which support widespread mould growth, so if there is mould, something is wrong. This could be simple excessive humidity, due to poor ventilation or inadequate heating. It could be due to a leak or ingress of water through walls or ceilings and many other causes. What counts, is getting good damp diagnosis so that the cause of the mould can be found and then fixed with straightforward heating, insulation, ventilation or building repair. This is relatively easy and there are hundreds of competent surveyors and specialist contractors who can help you with this. Once the damp problem is rectified and the home is dry, simple removal of the mould without any drama or expensive chemicals or so called ‘decontamination protocols’ as the pseudo ‘certified’ mould inspectors call it, will do. The mould will not return to grow again, though in any house in the UK, the spores of many many mould species will always be present, if you look hard enough – mould is ubiquitous. Two big changes have revolutionised the way we live and the way we build houses. Since the war and even since the last few of decades, we as families have changed. I remember when I was a child we had a bath night and I shared a bath with my brother – imagine that now, with most houses having one or more showers which are used daily. Clothes are worn once and no more, before being washed – that was also not the case. Most homes did not have the money for domestic appliances to wash and dry clothes, so often this was done in communal launderettes and similar establishments, so the humidity produced from the washing was also ‘outdoors’. This means that a family of say three or four will produce much more humidity per head, than would a larger family back in the day. Drying clothes is done on the radiators all over the average house or via tumble dryers at home these days. Larger families obviously produce more humidity via washing, cooking and such and whilst the average family size has fallen, with the growth of prosperity, this is different in many immigrant families who culturally favour a larger family, though with the same higher standards of cleanliness which produces much more water vapour. The house I grew up in had three bedrooms and a total of 6 chimey flues in two chimney stacks. All of these were used daily. The water vapour we produced went up the chimney with the combustion gasses and was replaced with make-up air dragged in via the loose fitting sash windows. Ventilation via constant air changes was the norm. Now these houses are still standing and the fireplaces are bricked up and the windows and doors are sealed, double glazed and very tight fitting. Of late, as a result of rushed and ill considered environmental standards, even the small trickle vents in double glazed windows are being removed. We live in sealed boxes. Whilst building regulations do address extraction needs in bathrooms and kitchens, owners are not informed on the crucial role these fans play, in keeping a home dry and healthy. The fans wear out, are switched off and even removed entirely when a house in modified. So the facts are clear; our houses cannot cope with our modern lifestyle and this has not been addressed by the building regulations, or by the refurbishment standards as homes have been modernised. Mould growth is on the rise and that is the fact. What is needed is action to raise standards in the control of the internal environment of new and refurbished homes to take account of the above, so that except in exceptional cases the growth of mould indoors becomes rare, or at least confined to the odd bit of mould growing temporarily, on grout behind a well used sink – that never hurt anyone. Now that we’ve established the reasons for the growth of mould lets look at the hysteria surrounding it and the birth of ‘Toxic Mould’. For starters what is toxic mould? The answer is there is no such thing. The term ‘toxic mould’ was coined by reporters and printed in newspapers and on line because it sounds good and catches the attention. That sells papers and on-line advertising. 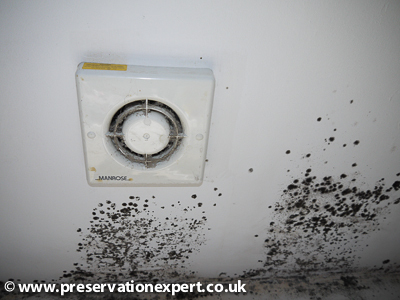 Mould is a fungus and it produces spores – there are many thousands of different species of mould. Some species of mould can produce chemicals to fight off other moulds it is in competition with. So if we have a mouldy patch of wallpaper and mould A is happily growing over it, then mould B will be repelled, so the chemical is ‘toxic’ in that sense. When humans compete we may do that by punching or kicking each other, but humans are not referred to as ‘fighting humans’ no more than they could be called ‘loving humans’ ‘car driving humans’ or ‘philosophical humans’. Thus mould, like a human, can do many many things, it can cure you of illness and we’ve all heard of penicillin, which is a mould. I like the sort that grows in Rockfourt cheese. That said, some of us are allergic to penicillin, so much so that this allergy could kill – peanuts, pollen and latex, amongst many hundreds of other plants and substances can have the same effect – where are the stories of ‘toxic peanuts’ and ‘toxic trees’, or ‘toxic gloves’? So is mould toxic or not? Well it may sound like a step back but yes some mould can produce ‘toxic’ chemicals. However, to use the term toxic mould, as if there is some bogey man mould growing in your home, which can harm you and of which you should be fearful about, is a gross exaggeration of the truth. The rise of The ‘Certified Mould Inspector’. A Certified mould inspector will get very excited when shown him this mould. Sometimes they’ll reach for their respirator (probably the full face type like off a Hollywood germ warfare movie), they’ll explain that mould is toxic and they will be very concerned about your health. The fact that they are there usually means you’ve been ill or read something about toxic mould or maybe you’ve been frightened by reading one of their mould consultant web sites, or other on-line mould groups (which are the last thing anyone who wants to know about mould should ever read). Once the inspection is done you’ll be asked about your symptoms – brain fog? Dizzyness? Blurred vision? Tremors? Memory loss? Irritability? Mood swings? Loss of libido? Excessive libido? Loss of appetite? Short of breath? Runny Nose? … by this point the guy in the mask is backing away as if you have the black death… (I was told of one expert who will even tell you his lips are tingling, which is a sure sign of toxic mould – though why if he is so effected he doesn’t get another job I’ll never know). You are probably feeling quite worried by now – your fears are confirmed, the symptoms you have and even the ones you didn’t know you had are there… god help you. Now then, what our fictional mould inspector needs to find now is an angle to make some money. How he does this will depend on the answers you give to the following questions…. Do you own the house or do you rent it from a landlord? This matters because if there’s a landlord this is the opportunity to make you the victim of unfair and uncaring others – ie the Landlord and most likely his insurers. It’s the landlord’s fault that you have mould in your house – it’s the mould, which has made you ill – therefore the landlord made you ill! If on the other hand you own your house then the tack changes… when did you buy it? Did a professional survey it before you bought? Was the mould mentioned? If not then have you had any building work done recently,? Who did that, maybe we can blame them! Once convinced that you are the victim of toxic mould syndrome (another made-up phrase), you can be persuaded to appoint said mould inspector as your expert. This will mean paying him more money and once you do this you are bound into the following cycle of expensive, stressful and wasteful events. There will be more detailed testing and an exhaustive survey, along with lab results; sputum and blood samples and all sorts of queasy medical language will be used to make you feel well and truly ill. The report and it’s damning findings will go off to the hapless landlord or surveyor, in the hope he or his insurer will just pay up in panic – this sometimes works because the report will be baffling and long with tables and many Latin species and spore counts included.. it must mean something mustn’t it? What it means is the mould man is very keen to get your and then the insurers money that is all. The facts are that the toxins in the mould are present in such vanishingly small quantities that you cannot ever get a harmful amount into your system, by any reasonable means (please tell me you don’t harvest the mould every week, by carefully scrapping it off and mixing it into your baby’s milk?). But the tests prove that you have X.Y or Z in your blood and sputum, so you are poisoned the mould man says. The fact is that every person in the UK has toxins of many kinds in there blood and with the advent of modern forensic science the smallest trace can be found, so because it is there it doesn’t point to it causing the symptoms Mr Mould made a list of. For example – the blood of most people in the UK contains tiny amounts of Lead, Dioxins, various gender warping chemicals and of course alcohol, nicotine and trans fats – this is normal, though not that good for our health. No wonder we have blurred vision. The fact is that the dose of a toxin is what matters and the tiny amounts of the above do us little known harm, though through a cocktail of ‘toxins’ we may be heading for trouble. One of my least favourite ‘mould experts’ likes to use the phrase ‘toxic soup’ when describing how poor our standards of decontamination are, when dealing with mould. It should be pointed out that these decontamination ‘protocols’ are the most flawed and wasteful endeavors imagined; if you buy into the toxic mould myth. The facts are that these moulds are everywhere, in every air sample we breath indoors or outdoors. Thus if you clean a house of every conceivable spore, the whole procedure is busted once you open the door and the dog runs in…. But what about my symptoms? Well of course that is for a doctor to investigate. Preferably one of your own trusted contacts and not a doctor on some sort of panel the ‘mould expert’ has recommended. That would be like going to the whiplash specialist doctor the whiplash claims company recommended wouldn’t it? I mean we are not being dishonest are we? Here’s the thing about toxic mould symptoms. They don’t exist! OK so the symptoms do, but there is no evidence linking the symptoms to mould. There is only presence of mould in houses where people with symptoms live. This is what is known as an association. 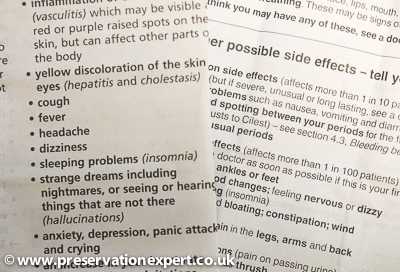 So the mould expert can say with honest conviction that ‘mould in houses is associated with these symptoms”. What is not ever explained is that an association is the very weakest of all scientific terms and means next to nothing. For example, having read the above it can be seen that there needs to be damp to give rise to mould. Thus ‘damp houses are associated with ill health’. Now let’s expand on that… we know that damp houses are usually poorly maintained or designed or the household may be underfunded.. so ‘poorly maintained housing is associated with ill health’ and ‘poverty leads to ill health’. These associations are all true so where does mould fit in? Well we can show that many people in damp houses get ill. But not many damp houses have any significant mould so actually the mould, despite getting all the publicity is probably not a major cause of ill health in poor or damp households. I got sick of reading by now and felt quite ill myself so I put the leaflets in the bin. These drugs are common and are taken in doses, which are orders of magnitude higher than any quantity of mould derived micotoxins which could possibly get into the body……without constant mouldy wall licking. Let’s also consider the very common poisons consumed, handled or applied to the skin every day by many people (including me). It’s been known for hundreds of years that we are very sensitive animals and our physical well being is firmly linked to our mental state. Thus in clinical trials it has been proven that stress is a real causal factor in very many symptoms of ill health including many of those listed above. Then there is our modern diet of chips and processed food – with all this in the picture why is it that mould is singled out? Now then; who are the most stressed people with the poorest diet? That’s right, those who have less financial means and coincidentally live in the damp, underfunded, poorly maintained houses we spoke of… another association? This is how complex human health is – it is not for self styled mould experts, trying to make a few quid to even comment on – or me for that matter. Doctors are under enough pressure these days, without me talking a tenant into asking their doctor about ‘mycotoxins’! This is what the mould experts do – why is that? The facts are that mould is an easy target because it is visible and unsightly, but in truth the chances of the mould being the cause of anyone’s sickness – other than seriously immune depressed or sick people, is tiny and the symptoms are probably the result of something else, or a combination of factors. Of course invasive infection by mould is a real problem in hospitals and occasionally, people outside hospital, who are otherwise healthy can and do come down with ‘farmers lung’ or some other problem associated with mould. Before panicking over the mouldy patch in the corner of the bedroom, get some advice from a qualified damp specialist or surveyor and get rid of the mould for good. If your symptoms go away – then that’s that; forget it. If they remain then it probably wasn’t mould anyway, (remember that mould is everywhere, even if you can’t see it). See a Doctor and look around with open eyes – don’t let the mould experts con you. PS – Independent specialist surveyors and qualified contractors can be found on the Property Care Association web site and via RICS. Thanks Ross – I’m glad you like it. Hi Bryan, I like that article about mould nice one. Fantastic article Bryan, some sense written at last about the effects of mould and those who try to scare the living daylights out of people. There were a few spots of mould under the kitchen sink, that was all! When you are wrong, you are wrong! Dry Rot, I can only assume you oppose individuals proclaiming their ‘toxic mold’ woes due to your personal interests. Poison is poison, and enough exposure to a toxic mold forming out of a household material laced with resins, glues, and chemicals will indeed sicken even the healthiest individual’s. Mold spore reflects what it consumes as do you or I, so for you to say there is no validity to toxic mold, suggests you are biased and vested in disassociating any legitimacy from it’s truths and wraths. You do note the risks associated with it although, for your own reasons reduce them in doing so. It is people like you, which devaluate the menace toxic mold is, and in doing so; drive me in creating a greater social understanding of it and means to its legislations. Read my book ‘Political Mold’, and look for the related website October 2014. I will have a section within it dedicated to people just like you; exposing them for their self serving reasonings in their disassociations towards toxic mold. I fully challenge your benign, masonry driven perspectives and interests, Dry Rot. Resolve, accountability and legitimate legislations towards toxic mold are coming. The question is Dry Rot, what liability do hold towards this action? I will be surprised if you post this, as it appears you only allow censored sheepish acknowledgments and sunshine type praises. It’s interesting that you claim I have a biased agenda , when you are clearly marketing your book. However, I’m happy to plug that for you here 🙂 Good luck with it. I can assure you that my views are based on what I’ve found out by looking into this mould malarkey. I could make lots of money from mould, if I were that way inclined. There is enough media driven panic surrounding it. Which means lots of homeowners, landlords and tenants and others to be sold expensive HEPA vacuuming and sterilisation – not to mention the mould testing and certification I could make a killing on. The trouble is though that I wouldn’t be able to sleep – despite the soft duck down and silk bedding I would have, what with all the money! No, I’d be like the Princess and the Pea and would toss and turn and have to get up and drink strong liquor, in an attempt to wash away the guilt… so I could sleep soundly. You see Wayne, I’d feel guilty because if my clients were ill, before giving me all their money; for mould testing and cleanings and such, they’d still be ill after all that work. That is because, as you know billions of mould spores are everywhere, so unless my clients stayed in a bubble after I’d finished, they would be exposed again so they’d never get better. In effect I would have taken their money under false pretenses. Which I fear is what most ‘mould inspectors’ ‘mould certificators’ and ‘mould decontaminators’ do. Ask yourself this Wayne “Who is making money from mould” That is where you will find the ‘bias’. The money is not is claiming toxic mould is an over-egged con (it is). Nobody pays me for it anyway and I don’t sell some weird alternative to the crap solutions the mould industry is peddling…. Hang on Wayne… I bet there’s money in writing about mould, speaking at mould forums, training and such… oh sorry, you’ve already thought of that… strike it… silly me. seriously though Wayne, I do have an opinion on these things – just like you do. We may not have the same opinion but the internet is great for everyone to get their opinion out into the world – so well done you. I’m not so keen on your attempt to ‘blacken’ my name by inferring that I have a commercial interest in ‘poo-pooing’ the toxic mould industry, but if that’s how you try to win your arguments fair enough….. not very nice of you though Wayne? PS – sunshine type phrases…. nice one. Interesting reply Dry Rot, I can’t argue your point about corruptive individuals preying on sick, unsuspecting people although, this type of individual exists any where in any industry. For the most part these mould industry professionals are ethical and honest people. My concern is there are too many people disassociating the validities associated with toxic mould; in protection of their own attached liabilities with it. Government, institutions, big business and the wealthy; continually higher mercenary like professionals to provide them with un-legislated testing in their best interests, and not the true merit of the given mould colony. This factor is the problem, and the prime reason legislation and laws are required in it’s guidances. Dry Rot, from your response to my entry; it appears I may have offended you. I do however, sincerely apologize for my deliberate perspectives, though it is due to the aforementioned reason why toxic mould has not been legislated as of yet. The reason solely is politics. In time, and only after enough people have been sickened through it’s exposures; forming a valid solidarity towards it, will it be legitimized. I would not wish anyone ill doing through toxic mould exposure Dry Rot. Nonetheless, if this is what it takes to establish its legitimacies, may the cynics carry the burden. As for your invitation, I rarely travel abroad; although, if I do make it to your neck of the woods I will pass on your kind offer for a pop or coffee, and indulge in some of your countries finest ale! It is time to get the mould out of societies closets and into the limelight Dry Rot. P.S. It’s not about the money Dry Rot. I have no expectation on getting rich, only helping someone. However, if you see me in your neighbourhood pub in the future, it probably did. Excellent article, and one that I do relate to. I am from both a building and environmental health background, so I have been involved with complaints about mould. And know exactly what it is like at the coalface. I have a 13 year old grand daughter who has been sleeping and playing her bed-room in which there has been a water leak in the roof. She sleeps on the floor as the parent have buckets on the bed to catch the water. The wallpaper is falling off, and all her clothes (and her) smell of mould. The clothes are going black with mould spores. You can’t tell me that this is healthy. However after months, ( I dont know actually how long this has been going on), she has now been removed from the room, and the roof has been fixed. Now the parents want to redecorate and re install her back in the room. Is this wise as I believe the spores will still be in the air without proper eradication and I am very worried about her health. I’m sorry to hear about the terrible conditions your granddaughter has been living in. Sleeping in a bedroom with water dripping in the roof is certainly unhealthy for many reasons. First time I’ve heard of a little girl living such squalor in this country – sounds truly awful. As for moving back into the room, well it should be thoroughly cleaned of course. If the leak is fixed the room should be fine. Get her checked out by a doctor to make sure she has no infections or anything relating to living in a leaking wet bedroom. Good article I like the common sense approach but it is close to impossible to run clinical trials in that matter. It is true that someone could scam you however I live in a very dump climate in Ireland and out of necessity had to move into a house with mould. Unfortunately I have countless symptoms of mould toxicity and wouldn’t underestimate it as it influenced my life at many levels.